Personal seating licenses will go on sale March 1st, with general ticket sales beginning in the Summer. Visit Circuit of The Americas recently redesigned website to register for updates and information on their planned construction completion in August. A new Formula 1 circuit was announced today by state and local officials in a 10 year deal to feature a ‘Monaco like street circuit’ around the Port Imperial area of Weehawken, New Jersey. The race has been announced for June 2013, with a date most likely within a week of the Canadian Grand Prix, and one with a view like no other race: Manhattan’s skyline. Billed as a ‘truly green race’, organizers have planned for public transport to be utilized extensively around the circuit, which will accommodate 100,000 spectators around the 3.2 mile clockwise track. The project is being put together with private funds and economic impact in the area is expected at a rate of about $100M per year, with both West New York and New Jersey officials taking part in today’s announcement. While excitement has been running high around the new circuit in Austin, (which I visited last month), several of the key players around the new project in New Jersey were pleased with how things are taking shape there, and NASCAR promoter Humpy Wheeler took to the stage to lend his blessing to the project, calling it ‘. . . the best thought out project I have even seen since I’ve been involved in the racing business’. “I want to extend my congratulations to Leo and his team, as I know how much work they have put into making this happen. 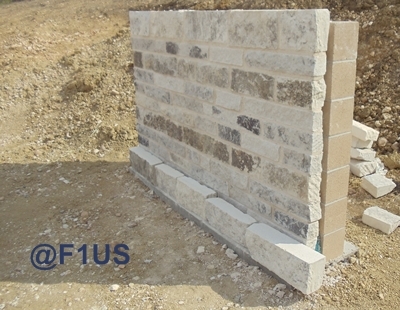 When I walked the site a few years ago, the site’s potential was obvious. I am excited for the East Coast and feel Tuesday’s announcement is yet another acknowledgement of the viability, fan interest, economic benefits and prestige an F1 Grand Prix event brings to a region. New Jersey and Texas, nearly 2,000 miles apart, offer unique and very different fan experiences destined to not only raise the visibility of the sport in this country, but also increase the global attraction and US support of these world-class events. 10/26 update: The above master layout for the circuit surface online this morning and shows several interesting details about the new circuit, including pit, track and facilities layout around the circuit. It’s not known at this time if this is a finalized plan, however, the drawing notes show the seating capacity at 125,000 and not 100,000 as was mentioned at yesterday’s conference with 6,000 hillside seats and 119,000 seaside seats. During a recent visit to Austin, Tilke engineering took the time to show me around the new Circuit of the Americas and share some of the work in progress there. Building a world class racetrack the scale of Circuit of the Americas is no small endeavor, and this low view from turn 1 shows the scale of what’s involved with this enormous project. As a future home to MotoGP and F1, the details count, and everything from the asphalt to slot drains receives the detailed attention of Tilke’s engineers, with input from founder/driver Tavo Hellmund, world champion Kevin Schwantz, and the dedicated engineering and construction professionals who examine every detail of the circuit’s construction. 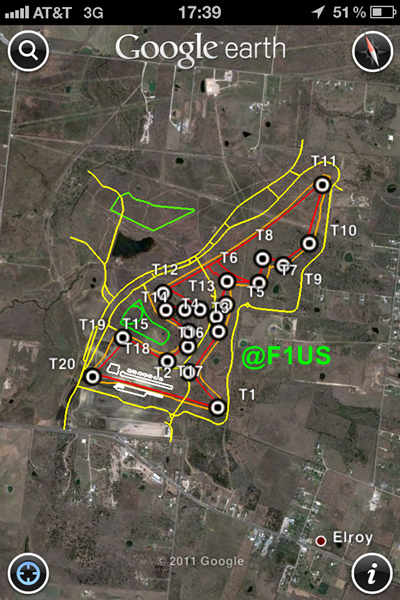 Materials used in the new circuit’s construction have been sourced from various locations around Texas, with offices and labs on site dedicated to analysis for use on the track itself as well as in the numerous sub layers and aggregate needed to create a road bed for the final asphalt layers. The final surface of the track must be comprised of a polish-resistant stone, and vary no more than 2mm over a 4 meter width, comparable to a billiard table’s slate surface. Moisture is a critical factor in the construction of a circuit, as trapped water expands and causes cracks with freezing weather, so record dry Summer in Austin (over 80 days of 100 degree weather this year) has created a good starting point as the grading continues and the track takes shape. 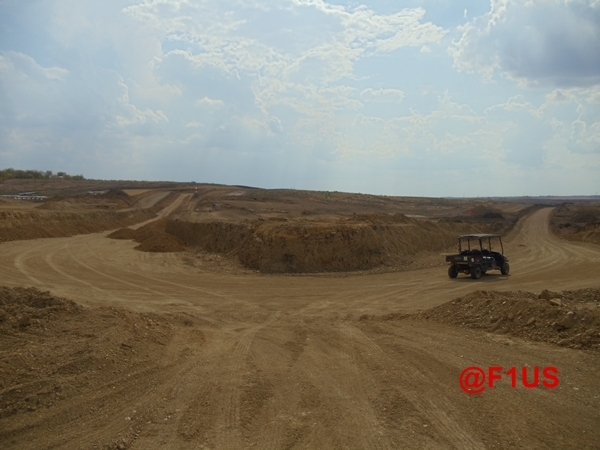 Wide runoffs accommodate the high safety demands for F1 and MotoGP, and the massive amount of earth already cleared and sub grade that has been laid down has started to give the site a first feel of what turns will look like from various perspectives. As we complete our lap looking down the main straight back to turn 1, the excitement building to 2012 sets in – but there’s also a special feeling around the project among the engineers (many of whom currently live in Austin and have built circuits all around the world) – that Austin is a very special destination, and that Circuit of the Americas has been put together with a shared vision for racers and fans alike. Update: Beginning January 2012, Circuit of the Americas began releasing a series of stories about the circuit construction process on their website called ‘Track Facts’ and is worth a read.